This is enlightening and a little frightening. …the first group on the list is evangelical Christianity. 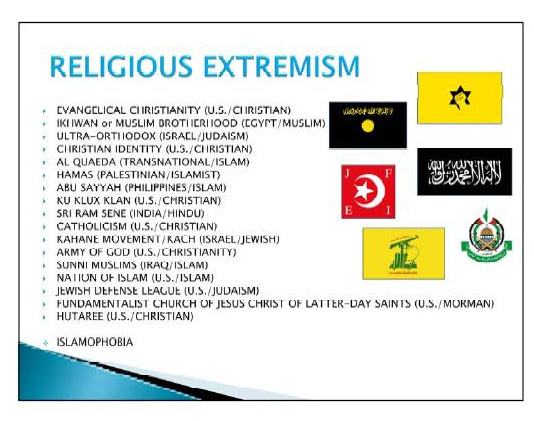 Catholicism and ultra-orthodox Judaism are also on the list of religious extremist organizations. I’ve just replied at source, stating I wish this could be truly said of Christianity in a SPIRITUAL sense. If only we were indeed “Onward Christian soldiers, marching as to war” – not with physical weapons, but with the undeniable evidence of a living God within us, showing forth His light, love, mercy and grace to all we meet, and allowing HIM to draw many to Himself through us. There is only ONE reason why this will not happen . . . me . . . and each individual believer. This is so true Angela. I am blessed that right now in our local body we are seeing an increase of personal evangelism being walked out among our congregants. I believe revival is upon us.